Make sure you’re prepared for anything! When you’re out in nature, you need to be able to handle whatever comes your way. Just one accident or unexpected situation can leave you needing to find new ways to survive – stay warm, get shelter, and eat. A good survival knife can make your time outdoors a lot more enjoyable on a good day and save your life in a worst case scenario. Sandstorm’s Dust Devil Mini Survival Knife will be there for you through thick & thin, and come through for you each and every time. The ‘Dust Devil’ – a beautiful Sandstorm Mini Survival knife. This 4” Mini Survival Knife has a 4” blade and the main grind was a high hallow grind with a false edge top and an upswept thumb ramp. The steel is D2 – a high carbon tool steel and tempered at 60 RC. 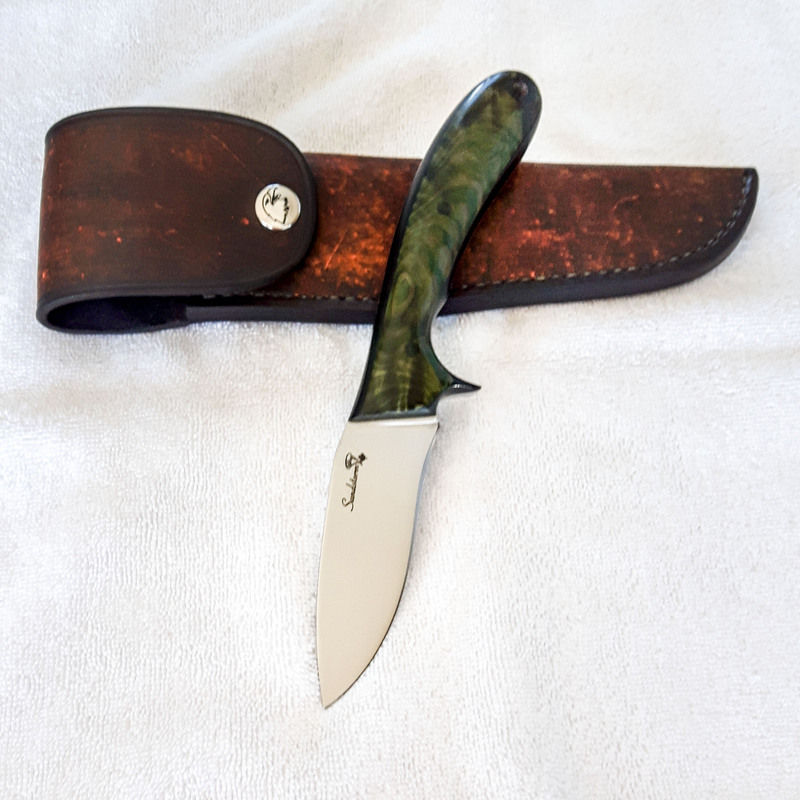 The handle is Presentation Grade Dyed Green Red Cedar Burl with 2 x 3/16” black canvas Micarta pins and a 3/8” black canvas Micarta thong tube hole. The sheath is 9/10 ounce drop point pouch style with the flap and snap enclosure. It was done in the Terra Cotta Design exclusive to Sandstorm Custom Knives. Like all our Sandstorm Custom Knives, the Dust Devil comes with a lifetime warranty and free lifetime sharpening. Plus, a custom leather sheath that fits perfectly and keeps it tucked away safely until you need it. 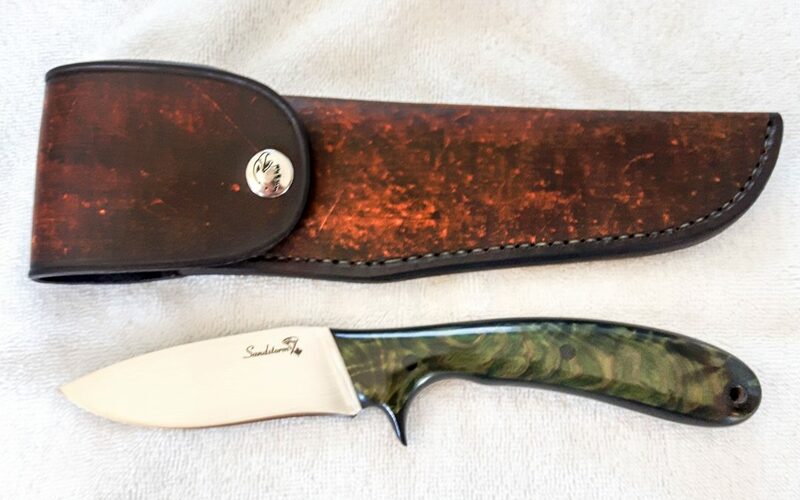 Order yours today and talk with our custom knife maker Scott about your customization needs. We’ll make sure that your mini survival knife is exactly what you want – and, most importantly, what you need.